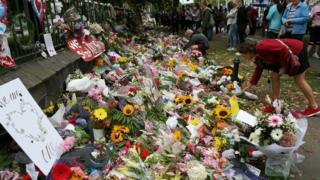 The original live video of last week's Christchurch attacks was viewed 4,000 times before it was removed, Facebook has said. Once alerted to the video, Facebook removed the original and hashed it - essentially made a digital fingerprint - meaning that material that was visibly similar to the original could be automatically detected and removed. "We continue to work around the clock to prevent this content from appearing on our site, using a combination of technology and people," wrote Facebook vice-president Chris Sonderby in an update posted on the platform. New Zealand Prime Minister Jacinda Ardern said social networks were "the publisher not just the postman", in reference to their potential liability for the material shared on them. Australia's leader, Scott Morrison, expressed concern over the "unrestricted role" of internet technologies in terrorist attacks. In a letter to Japan's Prime Minister, Shinzo Abe, who also chairs the G20, he asked for the issue to be discussed at the upcoming meeting of the G20. Facebook seems to have acted pretty swiftly in the circumstances and it is striking that it was an 8chan user who made the video go viral. But the real question is whether it was sensible to give between two and three billion people instant access to a live broadcasting platform Facebook must have known would be impossible to moderate in real time.